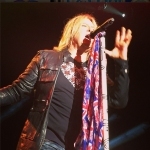 Def Leppard played the second of three casino shows last night in Rancho Mirage, CA with another 16 song set played. The band played a 90 minute set at the Pechanga Theater at Pechanga Resort and Casino. Their first visit to this city. The show started with the 'Won't Get Fooled Again' snippet before the band went into the usual 16 song setlist. 'Promises' replaced 'Make Love Like A Man' with the rest of the show unchanged. 'Let's Get Rocked' was also played earlier than normal. Joe added in the David Bowie 'Heroes' tag at the end of 'Hysteria' as he used to do on previous tours. Joe led the crowd in singing Happy Birthday to Rick Allen who turned 51 yesterday. This was the third full show with guest Steve Brown on guitar who is standing in for Vivian Campbell while he undergoes Stem Cell treatment at a hospital in California. The first Fan Video/Photo (links) have been added. Visit the show page to view them. Last played on 4th September in Mexico City, Mexico. Joe ended the song with lines from the David Bowie song. First done on the 'Euphoria' tour.